An unsettling thought: there have probably been more virtual Nazis killed on Xboxes, Playstations and PCs than Jews during the Holocaust. WWII is irresistible to gaming in the same way it’s irresistible to popular film: a moral conflict as definite and obvious as the Berlin Wall (how’s that for a mixed metaphor?) played out across every climate this planet has to offer, in every mode it can support – land, air and sea. You Fight the Good Fight, and almost without exception, you fight it in Europe. Why? The misleadingly named Pacific Ocean is an unhappy body of water. 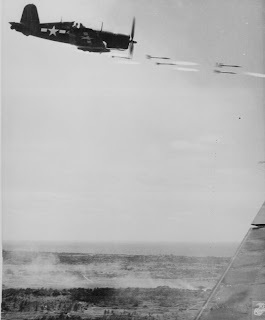 The war for the Pacific was nasty, full of charnel-house beach landings and suicide attacks. The Pacific campaign was spurred by the attack at Pearl Harbor. Maybe it can be construed as sort of a revenge story, but as the Marines slog from island to island, the point kind of gets lost in all the blood and lead. We fought an enemy that favored ritual suicide over surrender, who plowed their planes into our ships. And when they refused to surrender, we turned two of their cities to ashes and shadows. So no, it’s not the most glamorous war. But with Call of Duty: World at War and Battlestations: Pacific, the industry is testing those balmy waters again. Can gamers stomach the grueling, unhappy grinder of the Pacific Campaign, or did the industry glitz it unrecognizable? I should pour some out for the Medal of Honor series –they generously tossed two of their games into the Pacific theater, Rising Sun for the consoles and Pacific Assault for the PC. Neither were very successful . The technology of last generation was ill-suited to rendering convincing jungle environments, and the designers failed to capture the psychology of that side of the war – they seemed to want Nazis on islands, wearing pith helmets. To be fair, the franchise was on its way out. That hemisphere didn’t see another game until Battlestations: Midway, released for the PC and 360 in 2007. Instead of pouring you into the boots of a Marine, Midway put you in command of a fleet, allowing you to control fighters, battleships and subs. It was an ambitious system, and considerably well-implemented, even if the interface was a bit obtuse. Slugfests between battleships could get pretty enthralling, but besides that, the game was remarkably sanitized – if Marines were dying on beachheads, they were doing so on another screen, and quietly. The single-player campaign was gusty with hot air and patriotic bonhomie – we’d beat those Japs, gosh-darnit, we’d beat ‘em good. Call of Duty: World at War was Teryarch’s turn in their bizarre split-custody deal with the franchise. Its predecessor was Call of Duty 4: Modern Warfare, the rare game whose commercial success is matched by critical esteem. It was also fresh, yanking gamers out of the 1940’s and hurling them into the 21st century. CoD5 went back to WWII, with the Pacific theater as its selling point. From what I played of the game, nothing was different. The jungles were beautiful, sure, but the gameplay was not recognizably different from, say, Call of Duty 2. It’s not like the campaigns were at similar – read “With the Old Breed” by Eugene Sledge to get a sense of the murderous, lurching combat of island sieges. And again, Teryarch failed to capitalize on the heatstroked terror of fighting an incomprehensible enemy in a jungle paradise. Take a look at this mission briefing – they turned the Pacific campaign into a Gap ad. Not only does it ruin the atmosphere, it’s distasteful. From what I can tell of the Battlestations: Pacific nothing has changed – really, nothing. The music is the same, the voice overs are the same, and the same distant, bloodless feel presides. Seeing people stroll the poop deck on my battleship is all well and good when I’m sailing quietly, but when I’m getting pounded by five-inch guns, I don’t expect to see a soul on deck – and if they are, I expect to see them in pieces. Having them watch the battle like spectators is tantamount to saying: isn’t war fun? Maybe we don’t want to “play” the Pacific – really, who hasn’t been a bit unsettled by the constant reliving of the Battle of Normandy? But if we’re going to insist on setting games in the other half of the war, let’s do it some justice.